Being able to market yourself is an important skill in any field; and landscape architecture is no exception. In the fast-paced environment that we live in today, you have to be your own advocate. Social networking is an important skill to develop and business cards help make it easier. It’s important to remember that social media can never replace face-to-face interactions the same way a handwritten thank-you card could never be beat by an email. The field of landscape architecture provides a unique opportunity to combine natural elements with critical information on a business card to create your own branding for environmental design. A business card will help you to make your first impression, so it’s important that it represents you and the work that you do. Aside from your name and company, it may also benefit you to include your website address and links to your Facebook, Twitter, or LinkedIn pages as well as your phone number and email address. This way, potential clients have the opportunity to look at your background and work before contacting you for more information. Interactive cards catch people’s attention. 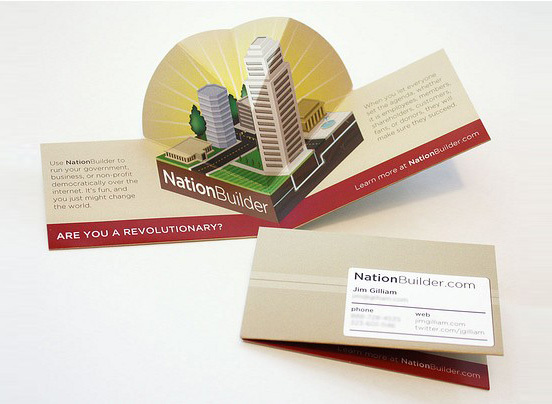 Nation Builder, a software platform that helps leaders grow and organize communities to achieve great things, uses this inspiring pop-up business card that illustrates a template design of a city. A similar card for a landscape architect might highlight the trees and landscape architecture instead of the buildings. Another contemporary concept for the conservationist landscape architect are these recycled business cards. Simply create a stamp with your business logo and stamp on anything you’d like! Choosing the right designer for your business cards will make all the difference and will help open the lines of communication in a new business relationship. They provide acquaintances with important information that might be easily forgotten, such as your name or company. Better yet, they provide a way for potential clients to have your contact information on hand when a phone book or the Internet may not be immediately accessible. Do you think that business cards are still as important today for self marketing despite social media forums for networking? Credit: Images and data linked to sources.